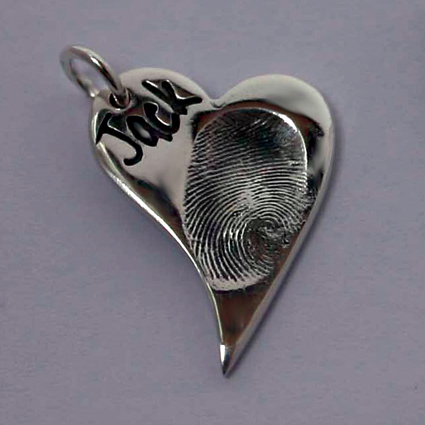 A woman who makes solid silver charms that capture a loved one’s finger or handprint believes her work may be of interest to the funeral profession. Hazel Sharp, who crafts the charms by hand from scratch using 99.9% pure silver, can also add names and short messages on the back. Almost 99% of Hazel’s business to date has involved using prints from small children to create pretty family mementos of the living but she wants to extend this to older children and adults and to memorial jewellery for when someone dies. “I have made several charms of stillborn babies for their mums with the imprints taken by hospital staff and have just finished a fingerprint charm of a boy of 15 for his mum,” she said. “I realised there is a need for this sort of memorial keepsake for a lost loved one. The prints are taken – by the deceased’s family or by the funeral director – using either a special putty (for fingerprints) or inkless wipes that leave no residue (for hands). Hazel sends these out immediately on receiving the initial call and the prints need to be returned to her as soon as possible (there is a little more leeway on time if the body is embalmed). Obviously, this can also be done before death. The keepsakes then take 10 days to three weeks to produce. For further information, call 07971898061, mail hazelsharp@hotmail.co.uk or visit www.foreverinsilver.co.uk.